To correctly model many slope stability problems it can be necessary to consider earthquake forces and external loads or forces that may have a direct bearing on the stability, or instability, of a slope under examination. Earthquake forces can be applied to models as a pseudo-static seismic coefficient, that can also be used to model blast effects. Distributed loads can be evenly distributed, or unevenly distributed - GALENA provides functions for for both, so that you are able to correctly and easily define simple and complex loads, including vehicular, roadway/railway, structural, equipment or dragline/shovel loadings. 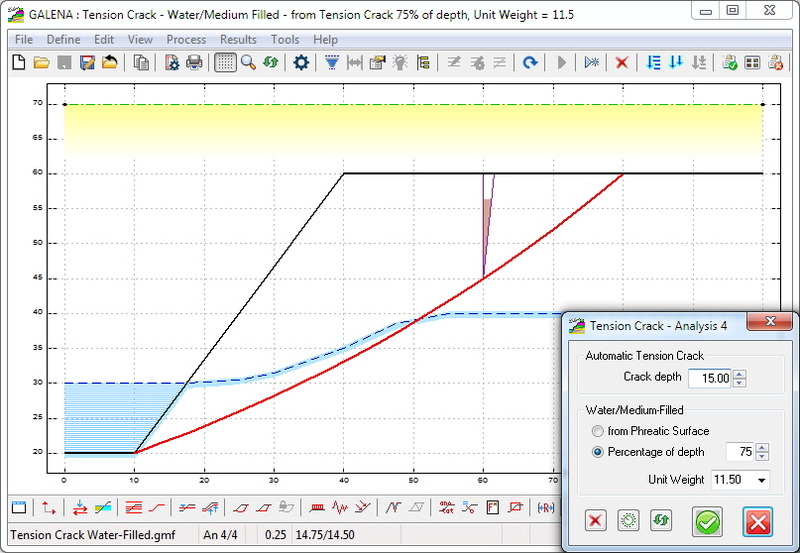 Hydrostatic water forces can be included by defining a tension crack as being water-filled to a nominated depth with a medium (water/slurry) of a nominated unit weight. Point forces of any value can be applied at any position and at any angle on the slope surface. The image below shows the use of an unevenly distributed load (behind the slope crest) with a higher loading at the left end. Quite complicated loading scenarios are possible with the Distributed Loads feature in GALENA. This model also includes an earthquake force, indicated on the image by the red arrow and value above. The image below shows a further example of the use of an evenly distributed load (in front of the slope toe), along with an evenly distributed load (behind the slope crest) with a higher loading at the right end. Both of these loads will need to be considered when analysing this situation, in addition to the included piezometric surface, phreatic surface and the weak dipping interbedded layer - all are within the capability of GALENA. 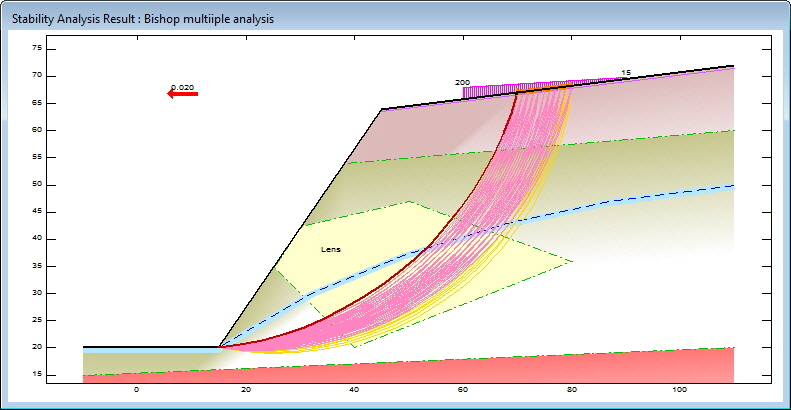 The image below shows an example of the use of a partially filled tension crack, and a phreatic surface to model the free groundwater level within the slope and water against the slope face after a partial drawdown. Each of these defined features will influence the stability of the slope, and will need to be considered when analysing this situation, and can be modelled within GALENA.